The visit was very good. Excellent service. It was quick and fast Dr. Banker answered all of my questions that I had. 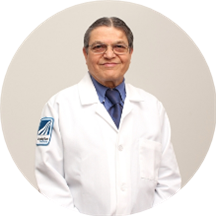 Dipak Banker is an attentive and interested pediatrician in Haverstraw, NY. Dr. Banker obtained his medical degrees from Grant Government Medical College, Mumbai. He completed his internship at King Edward Memorial Hospital, Mumbai. He completed his residency in pediatrics at Wadia Hospitals, Bai Jerbai Wadia Hospital for Children. He then moved to the United States to complete his residency in pediatrics at Kings County Hospital Center and Saint John's Episcopal Hospital. He continued his training by completing a fellowship in pediatric hematology and oncology at NewYork-Presbyterian Hospital / Weill Cornell Medical Center and Memorial Sloan-Kettering Cancer Center. Dr. Banker is a part of Crystal Run Healthcare and is board certified by the American Board of Pediatrics. Dr. Banker is deeply committed to the well-being of his patients. He takes a thorough and precise approach to his consultations to ensure that he is consistently giving accurate diagnoses.